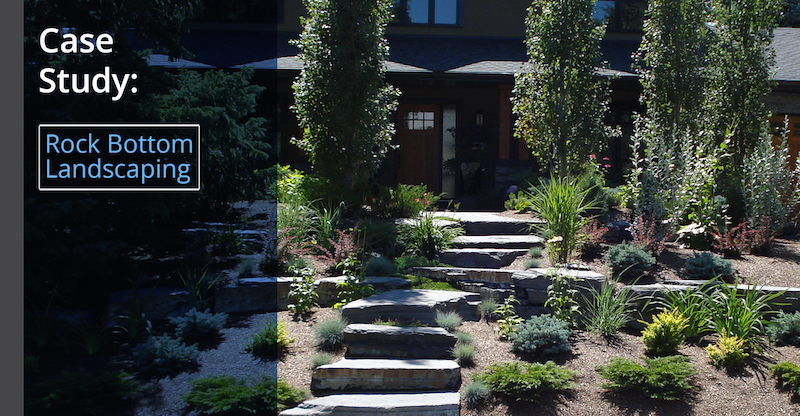 Established by certified landscape designer Beau Riedel in 1998, Rock Bottom Landscaping is a full-service landscaping construction company in Alberta, Canada. Riedel’s hands-on approach to serving clients has helped make his company a premier construction contractor in Calgary. Rock Bottom Landscaping’s efforts to generate new business were largely unsuccessful. The client’s previous marketing program required significant financial investment that failed to produce the conversions needed to drive business growth. Previous unsuccessful marketing strategies included a $10,000 phone book listing that only generated six additional leads per year as well as $3,500-per-month radio campaign that failed to create any new business leads. After spending another $10,000 in traditional flyer advertisements that made little impact, the client realized that the help of an outside consultant would be necessary to meet its business goals. Rock Bottom Landscaping contacted Spartan Spark for assistance with social media and marketing outreach. Spartan Spark developed a 90-day social media campaign that included regular content posting, social media management, and SEO assessment. The company also improved the client’s online visibility through a combination of paid advertisements on Facebook, Google AdWords, and referral marketing. Spartan Spark’s social media strategy effectively improved the client’s ROI and made Rock Bottom Landscaping the go-to business for local landscaping construction. Rather than using “cold” advertising approaches such as flyers, radio, or phone book listings, Spartan Spark’s marketing team knew that quality was more important than quantity for lead generation. By developing a stronger social media presence and a steady flow of customer-centric business content, Spartan Spark improved the quality of each lead at a fraction of the cost of traditional advertising methods. Rock Bottom Landscaping gained a stronger ROI and new advertising strategies to support its growth over time. To learn more about how your company can make its marketing efforts more effective, contact Spartan Spark today.